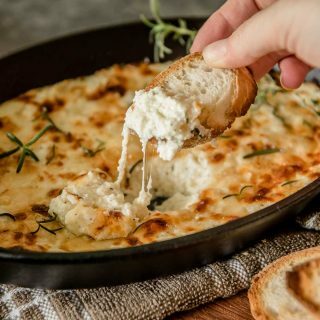 Warm, salty, and extra cheesy, this Baked Ricotta Dip is a delicious appetizer for any occasion. Serve it with slices of your favorite toasted bread and you’ll find it hard to stop eating! If you could make one food calorie free to enjoy for the rest of your life, what would it be? For me…it would absolutely be cheese. 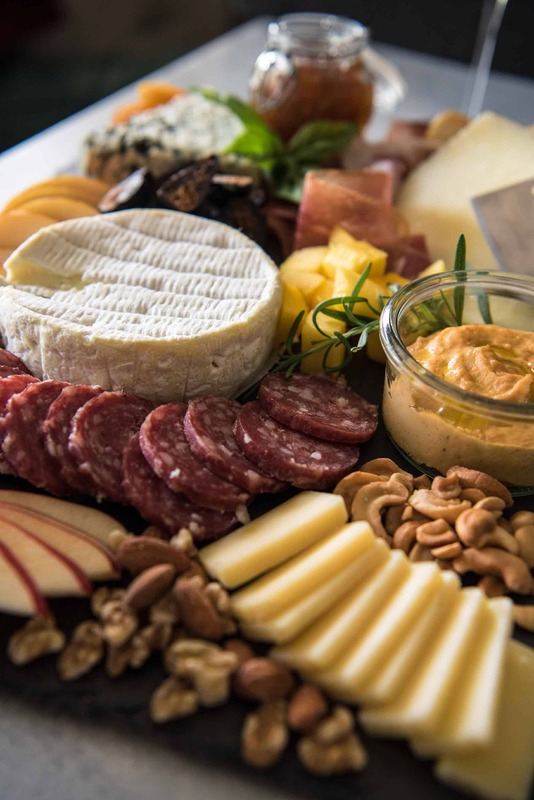 Could you imagine eating all the cheese you want, guilt-free? Slices, chunks, shredded or grated, warm and melted…it’s enough to make you hungry even though you just ate. And you know, this dip is exactly what I would start with. Warm, melty, salty, herby, gooey…quick, someone grab me a thesaurus. JUST TAKE ME TO THE BAKED RICOTTA DIP ALREADY! If you’d rather skip my (pretty darn helpful) tips and tricks, essential cooking info, and similar recipe ideas – and get straight to this deliciously easy cheese dip recipe, just scroll right on down to the bottom of the page where you can find the printable recipe card! As a food photographer, I’m always trying to improve on my craft. Making a living doing something I love is the dream, and the fact that it’s now my reality has me constantly seeking ways to be the very best at what I do. This past Spring, I was lucky enough to take part in the first Capture the Bite photography workshop, hosted by my friends Faith Gorsky & Julius Mayo. A very talented handful of other food photographers and I spent 3 days styling, snapping, and eating around Walt Disney World, and it was one of the very best learning experiences of my life. And not necessarily for the reasons you’d expect. Obviously, I picked up a ton of tips, tricks, and inspiration from Faith, Julius, and my fellow bloggers. Faith’s half of the tutorials included professional styling, with Julius covering on-location shoots. There were plenty of opportunities to snap in-the-moment photos since we had the chance to visit (and eat at) many of Disney’s wonderful restaurants. I wasn’t anticipating inspiration for anything but photography, and yet I found myself wanting to recreate many of the dishes we ate. 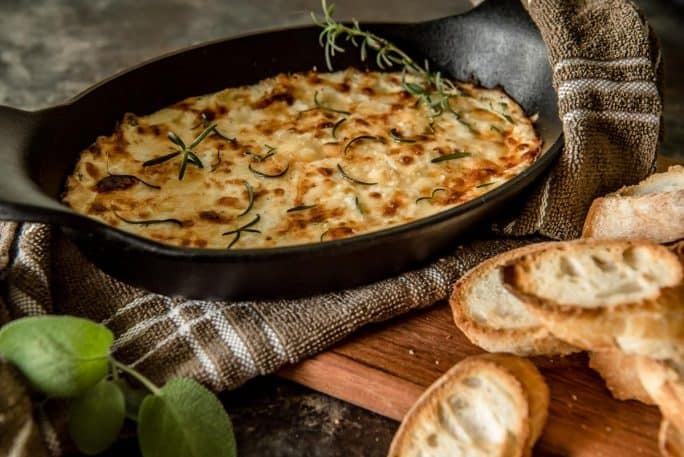 This Baked Ricotta Dip was inspired by the Ricotta al Forno appetizer (photo for reference by Kelly Stilwell) at Trattoria al Forno on the Boardwalk. It was by far one of the tastiest bites I had the whole weekend…and considering the delicious spreads we enjoyed, that’s saying something. …but far be it from me to turn down cheese. It was a table-shared appetizer, and even with the rest of the delicious tapas and meals we were served, I kept going back for more. Isn’t it crazy when something makes an impression on you like that? Just a simple cheese dip and it captured my heart. No lie…I’ve made this recipe 3 times since the workshop. It’s not exactly how I remember it (it’s not like Disney gave me the recipe or anything), but it’s close enough to satisfy! With the holidays right around the corner, I promise making a double or triple batch of this would please everyone at any shindig. Or you could just hide away in a corner and hoard it for yourself. You know, I totally wouldn’t blame you. Cheese lovers for life! 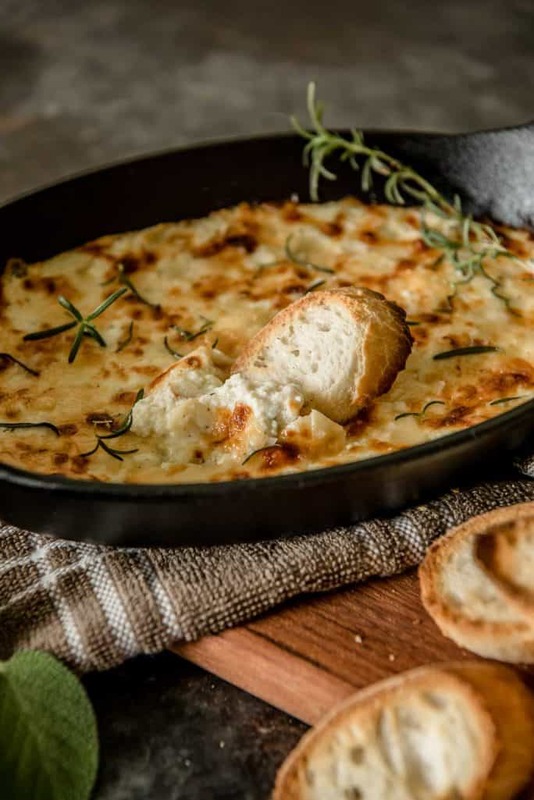 Warm, salty, and extra cheesy, this Baked Ricotta Dip is a delicious appetizer for any occasion. Serve it with slices of your favorite toasted bread and you'll find it hard to stop eating! Preheat oven to 400 degrees F. In a medium bowl, add ricotta, garlic, olive oil, lemon juice, and 1/2 tablespoon rosemary. Stir to combine, then season with salt and pepper to taste. 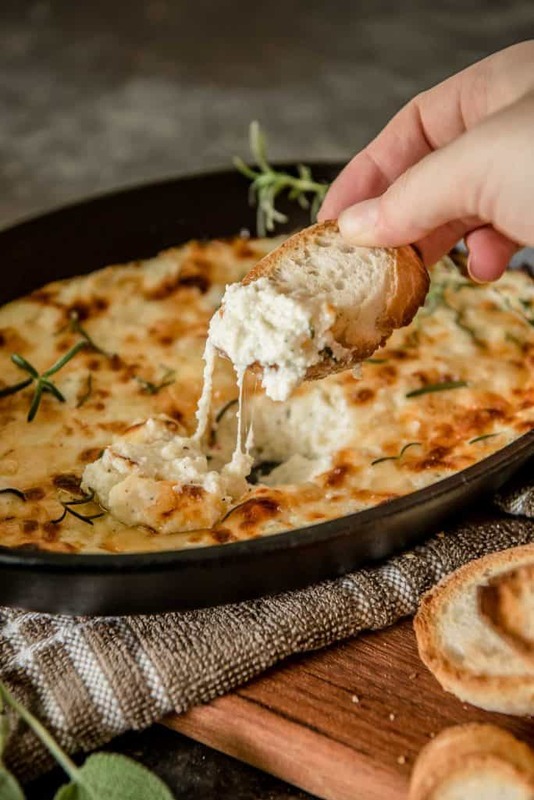 In a 6-inch cast iron skillet, spread the ricotta mixture in an even layer. Top with shredded mozzarella and Parmesan. Place in oven and bake for 15 minutes. Turn oven on high broil and cook an additional 5 minutes until golden brown on top. Sprinkle remaining rosemary on top and served with slices of toasted baguette. PIN THIS CHEESE DIP RECIPE FOR LATER! 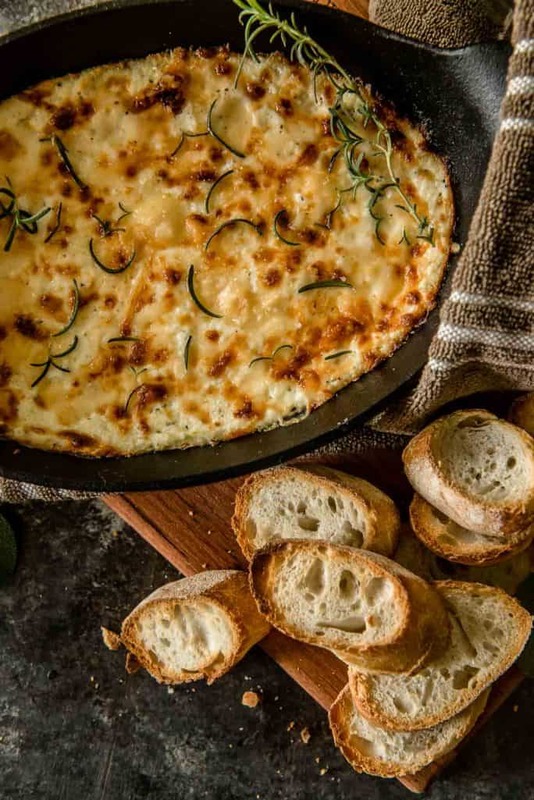 Love this baked ricotta dip? 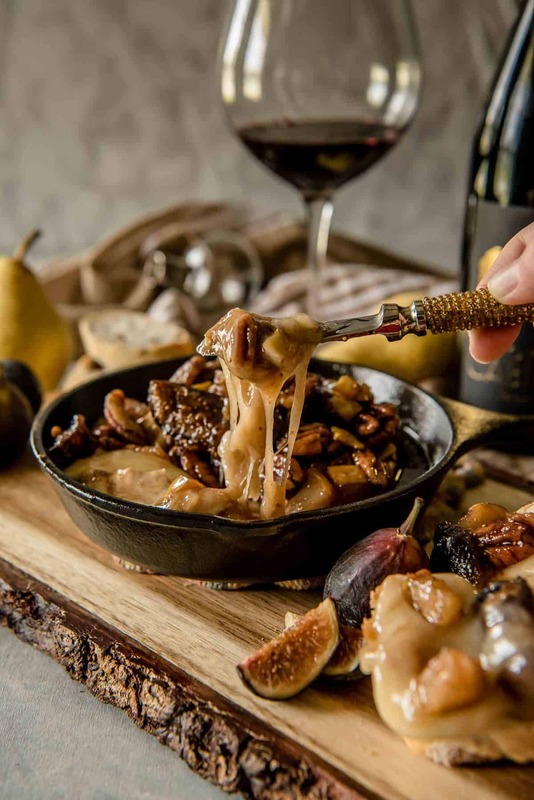 Try it with one or two of these other tasty cheesy appetizer recipes! Great dip!! Thanks for sharing!!! 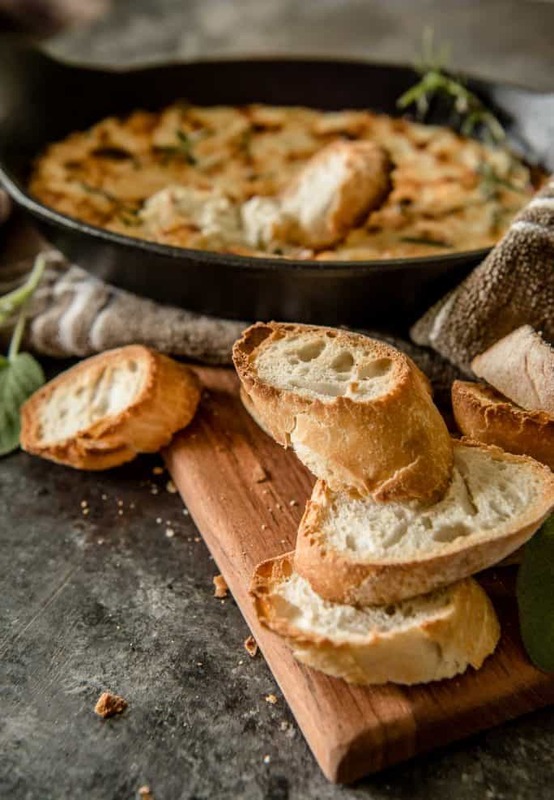 I love a good dip recipe, especially when there is cheese involved! The lemon juice is missing from the instruction paragraph……looks delicious! Easy and delicious! left overs? make some pasta with sauce of choice and top with reheated ricotta dip! Everyone loves it!